There it is Tracy!!! Thanks to all my friends who are helping me to learn the etiquette of Blogland...I appreciate your help and suggestions. I am new to this but my, am I having fun. And I love the comments....sometimes I feel as if the web that connects us all is so bright and textured. ...and the same of Lynsey's violet and pansy felt ring, next to a favorite old dish on my dresser which also made it into this month's "Country Living" piece entitled "Spring Fling" and two fabulous pieces from Dara DiMagno. Dara's wearable art amazes me. She taps her metalworking skills and harnesses a penchant for altered art, melding her visions into fancies that are as provoking as they are pretty. Dara called last night and we had the nicest visit...she'll be making the trip from West Virginia in May for our annual event and I cannot wait for her to meet everyone! ...there is never a day that passes without that sweet moment of realization...like the first perfect bite of a cupcake with more to come...I am reminded by the handmade creations that surround me of the many and true friendships that have been unearthed, discovered and fostered through a shared love of beautiful, whimsical and artful things. Today my sweet moment is dedicated to three of my very favorite people whose work is captured in the second image above...first to Jody Battaglia...without whom I would not be in business (true that!) 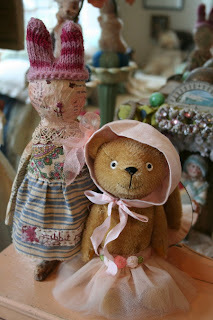 nor would I have ever discovered all that there is in the realm of contemporary folk art and teddy bears...I might just be Jody's biggest fan, but even better a friend (hope that shoulder is healing well Jody). Thanks Jody for putting the fun in my everyday. ....and also good thoughts go out to two talented women that I am thrilled will finally meet at my home for our Annual Spring Soiree...Debbee Thibault and Jill Wiener aka Earthgirl. Each of these women has become a special friend to me and their fabulous work has put such incredible customer friends in my path. Thank you all for this beautiful web of collecting, friendships and inspiration! Debbee you are simply the high diva in my world and Jill my honorary cupcake queen. I adore you both beyond words. Now, what's new here today at Earth Angels....the snow is still as pretty out our windows...a fresh dusting early this morning made it picture perfect. And Tracy, our mail carrier has just left me two boxes laden with plates from Jill Shcaefer...at long last!! Funny, Jill is Jody's sister, so how fitting I was typing the above dedication when Jill's latest creations arrived. Many of you know of my adoration for Alice in Wonderland...so how could I resist sharing this lush image. Many more images will be posted this weekend when Paul is back from his trip ....he's promised tons of updates: Valerie Weberpal, Debbee Thibault, Nicole Bowen, Jill Schaefer, Cheryl Kuhn, Diane Allison, Mudcakes, Dara DiMagno... so visit then for sure, or email if you need a sneak peek. ...I am taking pictures and more pictures today! !...enjoy your day...I am off for more tea and more pictures...yikes no cookies left...I wonder who ate them all??? ..at this point in the winter, I think we all daydream of spring. 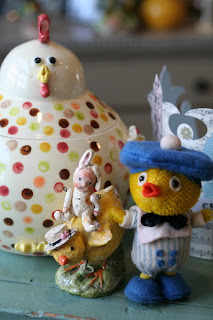 I find my mind wandering to fluffy bunnies, yellow chicks and of course the accompanying chocolate. Spring means cleaning, which in this house just mean curating new displays of holiday art...I've just put away the last rogue Christmas bauble (why do I always find that after all the boxes have gone into the attic??) and the Valentines treasures are stored away. And time for a confession, I just ate the last of the chocolate (after all those last 4 looked so lonely in the box!). And I know, I need pictures, but eblogger and I are having trouble...hope it works this time...I am attaching a picture of my favorite things...at least my favorites today...I love Jody and Julie and I think the textures are fab together for SPRING. So now back on the homefront...Boxes have arrived at long last from Julie Arkell!! Hurrah! I will email pictures later this evening if you'd like to see them, let me know...also goodies from Valerie Weberpal and a few more from Nicole Bowen...all spring like wonderful treasures to chase away the snow and fog. So...what are my current daydreams...it looks like an Easter tree will go up in the front hall, and yellow chicks will overtake the hutch...at least that's the plan for now...hope you all have fun finding distractions from the looming Spring Cleaning and the inevitable snow shovelling for those of you in northern climes. 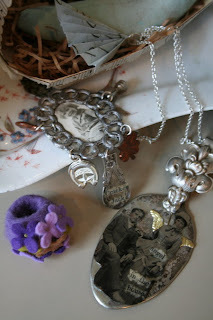 Before I left Warwick for my weekend's adventure (more on this below), I was inspired to move about some of my favorite collections....it super charges me to play with my goodies, folk art and fun things.... I have put away the last of the Valentine treasures and the chicks and bunnies are starting to try to pop out of their boxes. 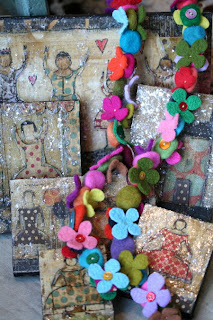 I just got off the phone with Lisa Kaus and she has a group of Spring themed work in progress. And Dara DiMagno just sent a new collection of jewlery laden with flowers and fancies (Paul has promised me major postings on the weekend of March 2-3!! so keep an eye out for her latest and much more from other artist friends). Ahhhh....just 4 more weeks of winter and then Spring can have it's fun and me along with it! Country Living ARTICLE!! Woo hoo! ...if you've yet to see the March 2007 issue of "Country Living" magazine, please check it out. It's a fabulous issue dedicated to women entrepreneurs, and there's a 6 page article on Earth Angels. How cool! I love that we got some fabulous attention for the wonderful artists with whom we work. Many thanks to Stacey Bear for making this possible and to Jane Dagmi for really understanding what I do and celebrating handmade objects. Go girls!